Members of the Big Walnut baseball team celebrate after beating Steubenville 10-4 in a Division II regional championship last Friday in Zanesville. Big Walnut’s days of sneaking up on people are over. 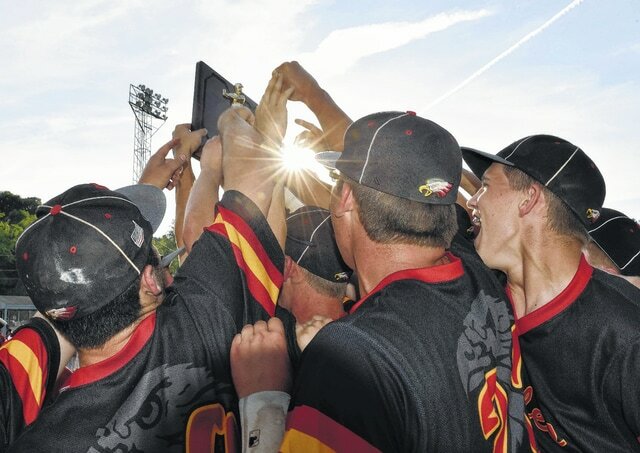 Defiance (26-5), the eighth-ranked Division II baseball team in the most recent AP poll, certainly knows what’s coming its way in today’s state semifinal at Huntington Park: a Golden Eagle team on a mission. Riding a 10-game winning streak, six so far in the postseason, the Eagles (22-9) know the stakes increase with each victory … they just aren’t playing like it. Prior to last month’s district semifinal against defending state champ Bloom-Carroll, a game the Golden Eagles won 5-1, they were having a nice little season. After back-to-back shutouts, a 6-0 win over Heath in a district final and 1-0 extra-inning thriller over Meigs in a regional semi, Big Walnut was poised to make a serious statement — one it made loud and clear with a 10-4 thumping of Steubenville to win its first regional title in program history. As the back-to-back shutouts indicate, pitching has paved the way. Tommy Fleser and Austin Becker combined to toss a three-hit shutout in the eight-inning win over Meigs. Fleser tossed the first five innings, walking six and allowing just a pair of hits to go with four strikeouts. Becker, who hasn’t lost a game all season (9-0), allowed a hit, walked two and struck out three in his three innings of action. Brayden Shepherd, the team’s No. 3 starter, pitched like an ace in the regional championship against Steubenville, limiting the fifth-ranked team in the final AP state poll to four runs, three earned, on six hits. Offensively, Nick Moser and Jakob Evans have been leading the way of late. Moser finished a prefect 4-for-4 with two runs scored from his leadoff spot and Jakob Evans closed 3-for-4 with a run in the regional final. Moser, in particular, is having a special season … one he’ll look to continue at least on more day. The junior leads the team in plate appearances (127), hits (46), runs (40), batting average (.455) and steals (50). His ability to get on and over has been huge as he’s only been caught stealing three times in 53 attempts. Big Walnut will have its hands full with a slew of Defiance standouts, too. Garrett Sierra leads the team in hits (41) and doubles (11) and is tied for the lead with two home runs. Shay Smiddy and Michael Hendricks, who allowed just two hits in an 8-0 regional final win over Bellevue, have been the squad’s best pitchers. Smiddy is 6-0 and Hendricks 3-0, both with ERAs under one. First pitch is slated for today at 1 p.m., with the winner to play the winner of the other semifinal between Bishop Watterson (24-8) and Poland Seminary (27-2).